Preheat oven to 350°F. Line cupcake tins with paper liners. Prepare cake mix batter according to package directions in two separate bowls. You need four medium sized bowls. In the first bowl: Pour 2 cups of white cake batter. In the second bowl: Pour one cup white cake batter and one cup chocolate cake batter and mix together. In the third bowl: Pour 2 cups white cake batter, green food coloring (I did 15 drops) and 2-3 tablespoons of chocolate frosting. Mix together and adjust for the desired camo green that you want. In the fourth bowl: Pour 2 cups of chocolate batter. Spoon a tablespoon of each color into each cupcake tin. Repeat the colors until liners are 2/3 of the way full. Bake for 15-18 minutes or until cupcakes are set and spring back to the touch. Cool cupcakes. For the frosting; Add one tablespoon of white frosting to the chocolate frosting container and mix well. 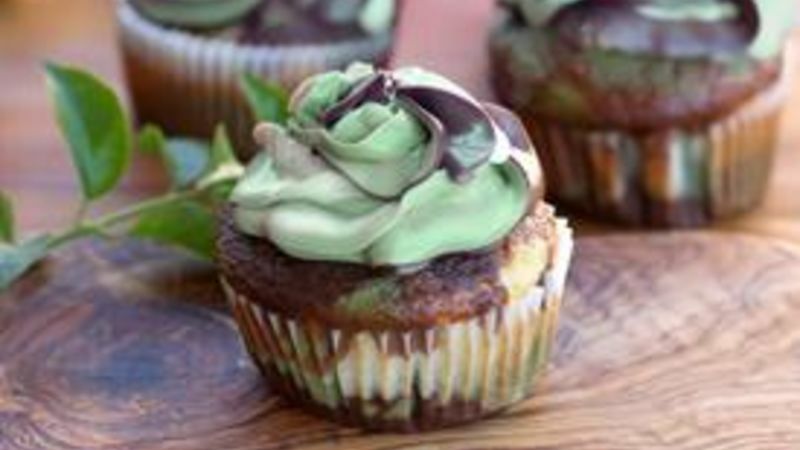 For the green camouflage colored frosting add one tablespoon of chocolate frosting to a container of white frosting along with some green food coloring until desired color is reached. Spoon the green camouflage colored frosting into a gallon Ziploc bag. Spoon the chocolate frosting into a separate gallon Ziploc bag. Spoon the remaining container of vanilla frosting into a gallon Ziploc bag. Cut off the corner of all of the bags and place them side by side inside of a large pastry bag fitted with a star tip. Pipe frosting onto cooled cupcakes. For Veterans Day -- or any day you want to show your appreciation -- these Camo Cupcakes are a creative way to say "thank you" with love. My dad served in the Korean War, and even though he is not one who usually likes the spotlight, he really appreciates being acknowledged for his service on Veteran’s Day. I think it's important that we all show our gratitude to those who have served for our country. Maybe it's with a card or just a phone call to a loved one. But you know what would go great with a card? Some Camouflage Cupcakes. I first saw these cute cakes on The Crafty Mama Blog and knew I had to make them. Begin dropping spoonfuls of each batter into your muffin tins. This is a little time consuming and a little messy. Each cupcake is like a fingerprint -- unique in it's design. Look how pretty they are once they've baked! While the cupcakes are cooling, we're going to make camouflage frosting to go with our camouflage cupcakes. I used three containers of Betty Crocker frosting to start. One container of vanilla frosting we're going to leave all alone for a pure white color. We'll add a spoonful of vanilla frosting to our chocolate container to give it a little bit of a lighter color. No need to dirty a bowl, just mix it up in the container. For the camo green just add some green food coloring and a spoonful of chocolate frosting. Now spoon each color into a large resealable bag, cut off the corner, and stick them all in a large pastry bag with a star decorating tip on it. This is going to give us that beautiful multicolored swirl look. The veterans in your life will love these cupcakes and appreciate the extra effort you took to show them your thankfulness!